Editing rotations are made and sent out by the Editorial Coordinator. Four to seven days before your edits are due, the Editorial Coordinator will email you with a link to the author’s article in a Google Document. Contact the Editorial Coordinator when you finish your edits. SWAC publishes two categories of articles on our blog: ‘Breezy’ and ‘Serious’ science articles. Breezy articles are just that – shorter pieces, often with a large number of pictures and illustrations, which share interesting science-related information. Serious articles are more science dense and typically discuss specific researchers or research topic. Breezy articles have one editor, who is encouraged to check for grammar, sentence-level structure/flow, and make organizational suggestions. Serious articles got through a two editor process. Editor 1 is responsible for fact-checking to ensure that the content of the article is accurate; Editor 1 is also welcome to make suggestions on grammar, sentence-level structure/flow, and organization. Editor 2 is primarily responsible for ensuring grammar is correct and that information is presented clearly. Please keep these different editing duties and responsibilities in mind as you edit pieces. 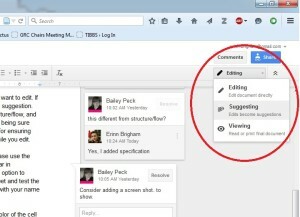 We currently use Google Docs for article submission and editing. Please use the “suggesting” mode instead of the “editing” mode (upper right corner of tool bar in document, see the figure below). 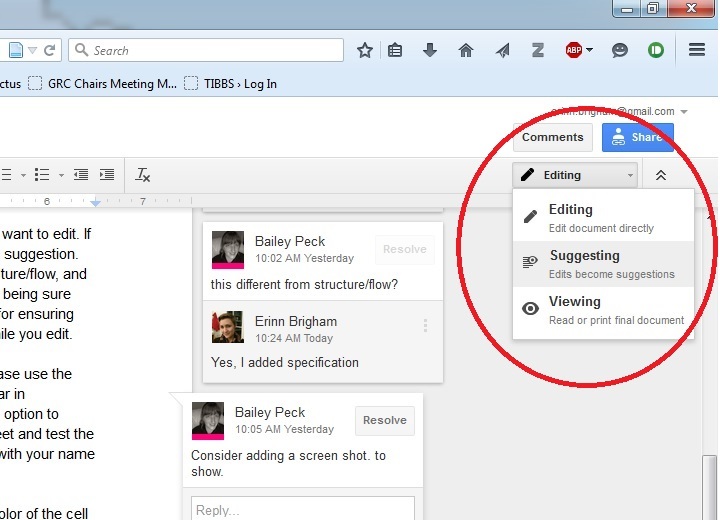 “Suggesting” in Google Docs is like using track changes in MS Word. Please also make use of the option to make comments, particularly when you are suggesting complicated or highly subjective changes, or questioning the accuracy of the author. When you are suggesting a change to whole sentence or several sentences, putting the alternative phrasing in a comment instead of changing the text can help avoid accidental introduction of errors. In general, we prefer to defer to the author’s chosen tone and level of formality. If you wish to suggest changes to tone or formality, please use comments instead of changing the text directly. For editing grammar, in-text changes are best. Please also remember to think about how you would feel receiving the edits you give. Be courteous and polite. No one likes to be criticized, so terse edits can make an author defensive. This is extremely common. The efficiency and helpfulness of the editing process is increased by considering the feelings of the author. If you provide courteous edits, the author is more likely to be receptive, and you will improve the quality of the writing more. It will also encourage authors to submit more pieces.